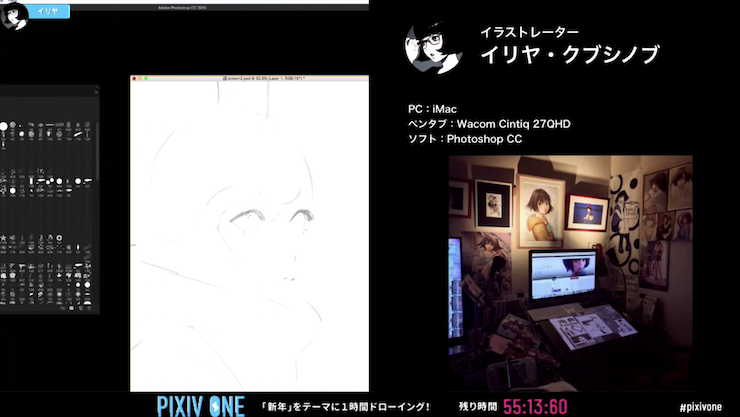 "pixiv ONE" is a one-hour drawing event that is broadcasted live on pixiv. After receiving tons of positive feedback for its first event, the second event is finally here! The highly anticipated second event is held on June 10 (Sunday) at a space specially installed for "pixiv MARKET" inside Sunshine City, Ikebukuro. pixiv ONE is a live drawing event that was first held on pixiv from January 5, 2018 to January 6, 2018. During the event, popular creators are asked to follow a specific theme and draw complete illustrations from scratch, within an hour. Broadcasted with commentary, this event enables fans to see superb skills that the creators haven't showcased anywhere else. The second event of pixiv ONE can be viewed live or through online broadcast. Two popular illustrators who will be joining this event are Mai Yoneyama and Kei Mochizuki! The event is finally taking place this weekend and Torako, who was in charge of being the commentator in the first event, is here to unravel the two creators' enthusiasm for the second event. I want to demonstrate my "hysterical strength"
── The event is just around the corner! I myself am a huge fan of your works and I can't wait to see the two of you drawing live! No, please don't be! I've always looked up to you, Yoneyama! I feel very honored that I get to draw with you. ── Yoneyama, you are also an animator. I have this image that the people (in the anime industry) are very fast at drawing. Right. We draw a lot of pages in the anime industry and I hope I can demonstrate the same hysterical strength for this event. I plan to spend less time drawing lines and improving the look of my illustration through coloring and finishing touches. And I suspect that I'll spend the second half of the hour applying filters. ── You also look like you can draw very fast, Mochizuki. I mean, you keep uploading new illustrations. That may be the case, but I too have never drawn an illustration within an hour before. I guess one-hour drawing is both a challenge and a chance to practice how to produce a drawing that is worth showing to my clients and, at the same time, looks "finished". Most importantly, though, I want this to be an interesting live drawing event to watch! ── By the way, Mochizuki, how long do you usually spend creating illustrations that you will upload on Twitter? It depends on the illustration, but I would say about 3 hours on average. Also, I spent roughly 2 hours drawing this illustration on pixiv Sketch LIVE. I watched your live streaming for this illustration. And yes, you drew so fast! Thank you (laughs). Of course, I normally spend much longer if the illustration involved is commissioned. ── At a glance, the quality of these illustrations looks extremely high, but could you please tell us which steps affect the overall drawing time? If you take a closer look at the lines, you'll notice the difference. When I draw for fun, my lines are bumpy and unconnected--basically, they don't look nice. When I draw a commissioned illustration, on the other hand, I pay close attention to the edges of the lines so that they won't break if we zoom in on the illustration. ── I see. Yoneyama, how long do you usually take to complete an illustration? It's probably because I often draw illustrations while working, but I don't have a specific average drawing time. This illustration took me about 5 hours to finish. I draw everything using iPad's "Procreate". ▲ An illustration based on "DARLING in the FRANXX", a series that Yoneyama himself participates in as an animator. ── Achieving this level of "finished look" within 5 hours--you truly are something else...! Anmi also used Procreate during the previous pixiv ONE. Do you find tablets easier to use? The main reason is iPad allows me to draw without much of a hassle. Also, I can produce rough drawings using Procreate. I'm the kind of person whose drawing time is heavily influenced by the types of tools that I use. I've tried CLIP STUDIO before, but I end up fussing over the little details and taking too much time. The simple colors make the lines look more prominent! It's such a wonderful combination! ── So, does that mean you'll be using an iPad during pixiv ONE? Nope. Procreate doesn't exactly provide us with good filters, so in order to make sure that my illustration will come out looking impressive, I'll use Photoshop, iMac, and an LCD tablet. ── When do you usually use a tablet to draw? Inside the train or at the desk...? I use it to draw for fun, which means that I would lie down in bed, get comfortable, and draw (laughs). Yes, that tends to happen. ── So you also draw while lying down in bed, Mochizuki? I basically do all of my drawing in bed, so I never use a desk. I would put my Cintiq Companion2 on my bed and draw while lying down. You draw everything while lying down? Even commissioned works? That's awesome! Don't you get sleepy? When I get sleepy, I just go to sleep. Don't you hate having to get up and leave your bed once you're awake? But if you draw while lying down, as soon as you wake up, you can just continue drawing without having to get off your bed. That's an advantage of my drawing style! ── You're amazing in so many ways. Do you have a desk though? I do have a table that I use to eat my meals at. But I never use it for drawing because I always draw in bed. I know it's bad for my body though. ── For your waist and shoulders (laughs). 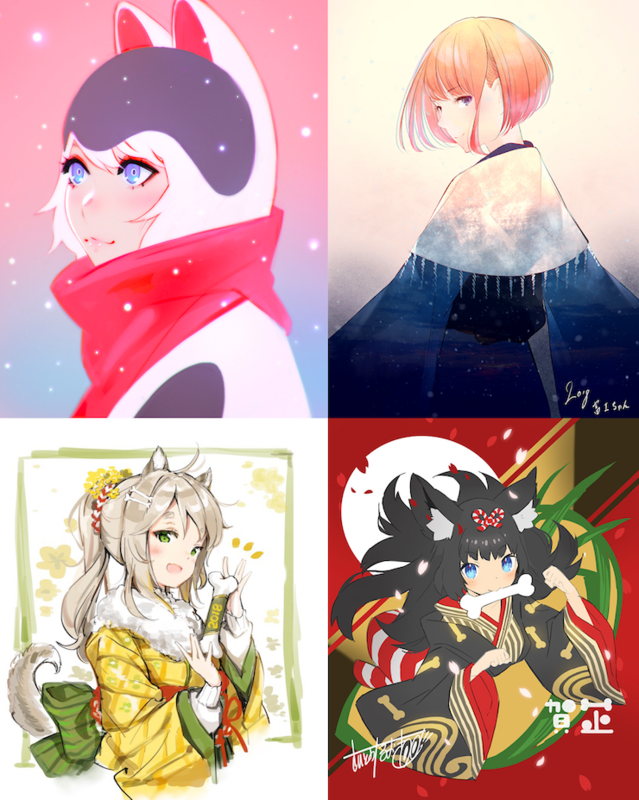 ▲ A portion of illustrations that have been uploaded by Mochizuki. The fact that these were all drawn in bed is quite surprising. ── By the way, when did you develop this drawing style? Back when I created analog drawings, I did use a desk. When I was a first-year student in high school, my father gave me a small laptop and then I got a pen tablet. Since then, I started drawing in bed. Although recently I sometimes felt like drawing analog paintings, I still ended up drawing them in bed. I've woken up to stains of Copic markers on my futon before--it was tragic (laughs). ── Your bed has become your headquarter! ── So, the two of you will be joining pixiv ONE soon. Please share your opinions on the first pixiv ONE event with us. Looking at the participating artists' other drawings, we can tell that those are all drawn in great details and have a high level of "finished look". When I was watching the live event, I honestly doubted that they could finish drawing within an hour. But all of them drew each stroke without hesitation and produced drawings that looked very much complete. I was astonished. ── Ilya completed his drawing in one go. That he did. It's amazing how being in a live drawing event didn't seem to affect his drawing style. Instead of using filters, he manually blended the area around the lines and to me, that was a valuable discovery. It was an interesting event. I regularly check the works of the four artists who joined the first event. Being able to watch these people draw within a limited amount of time that is an hour was such a new and fun experience. I remember how Naoki Saito drew his sketch on a piece of paper first (like he normally does) before giving it a digital form; he didn't skip a single step and he still managed to produce a neat background. ── None of them omitted any huge step for the event; they really just drew like they normally do. It was hard to believe (laughs). Painting wise, I'd say sousou's was the most interesting. He's got the best concept. I have so much fun learning about new things through an event like this. ▲ Illustrations from the first event. The new theme is "rain"
── There's also the fact that it's June now, but the theme of the second event is "rain". Compared to "New Year", which was the first event's theme, "rain" is a much more tangible theme. What are your opinions on the new theme? "Rain" is a spectacle and, honestly, I'm still pondering on what to draw because I don't usually draw spectacles. In my opinion, "rain" will be easier to express if I create an illustration that has a story in it, but maybe I should create an illustration which overall visual motif is "rain". Either way, I hope to incorporate the theme well in my illustration. I think "rain" as a motif is one that evokes emotions and allows an artist to be creative. Nevertheless, I want to make sure that my illustration does not end up looking too generic. The theme goes well with filter effects and since they happen to be right up my alley, I'm happy with this theme. Yoneyama's illustrations are very scenic, I can't wait to see how your illustration will turn out! ── I have the impression that people who work in the animation industry tend to picture their illustrations as moving images. Yes, most of these people aim to create a drawing that looks like it will "continue in the next scene". While more illustrators tend to focus more on how to make people see the best of the illustration at a glance (rather than continuity). The impact of the moment is such a powerful thing. Mochizuki, if you do choose to draw something scenic, I'll be looking forward to the final result! Oh, no... Now you've put pressure on me (laughs). ── pixiv ONE requires an artist to complete their drawing in an hour. Have you come up with some ideas to beat the challenge? In principle, I plan to draw pretty much the same way I usually draw my doodles. But I'm going to consider doing certain things differently in order to reduce the drawing time. I probably won't drastically change the way I draw either, but I hope I can reduce my drawing time by applying more filters than usual. However, using too many filters tends to make an illustration seem shallow, so I'll have to keep that in mind while drawing. ── The two of you have different styles and will both participate in pixiv ONE. How did you feel when you found out that you'd both join this event? Yoneyama is an artist whose illustrations I've been using as both reference and studying materials, so I was very surprised. I did, in fact, boast about it to those around me. Everyone was so jealous of me! One of the themes that I want to try drawing is "the balance between reality and distortion" and Yoneyama's works are the kind of ideal that I envision; I always dream of drawing like you one day. I may be participating in this event as an artist, but I'm also looking forward to your drawing! ── Such a high praise...! I've known about Mochizuki for a long time now and I adore all of your illustrations. I think you're awesome because you've thoroughly grasped the ways through which you express yourself. The impression that I have of you is that you've got strong feelings of love and trust toward your own style. That's why when I first heard that you'd join this event, I was like, "Yikes! I'm going to lose!!" (laughs) But at the same time, I was also happy because you're an artist whose drawings I can deeply relate to. The way you draw lines reminds me of anime in the 1990s; your works have an essence to it that gets to animators like me and it's also an element that makes your illustrations appear catchy and always new. I like anime and I love the lines and the distorted nuance that animators create. I guess anime greatly influences the way I create illustrations. Being able to properly incorporate the things that inspire you in your works is a terrific feat. I feel deeply honored for the opportunity to draw together with Yoneyama, who is valued highly in the industry at such a young age. ── Mochizuki, you mentioned that you have experience with live streaming. When do you usually do live streaming? Basically, I do live streaming on pixiv Sketch LIVE. I usually do live streaming on days when I want to draw some doodles but lack the motivation to do so, because I figure that having people watch me draw may do wonders for my motivation. Live streaming is easy to do, so I usually do it when I need that extra push of motivation. ── Is pixiv Sketch LIVE easy to use? I haven't found many live streaming websites that are easy to use. Most of them require certain software and settings, so live streaming on these websites isn't easy. Whereas pixiv Sketch LIVE doesn't ask for those things; I like it because we can simply "share" our screen with the viewers and that makes the entire operation light. ── It's convenient because we can start streaming right from a web browser. 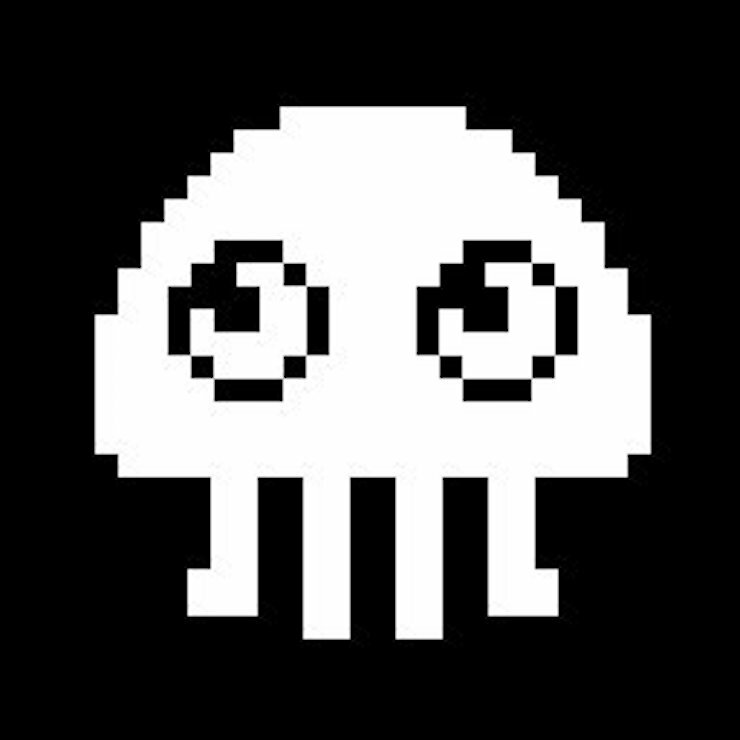 If I go on Twitter and tweet "I'm going to start live streaming", it sounds like an advertisement and it makes me feel nervous. But with pixiv Sketch, the moment I start live streaming, only my followers will get notified. I'm thankful for this feature because it saves me from having to publicize my live streaming and I can just begin right away. 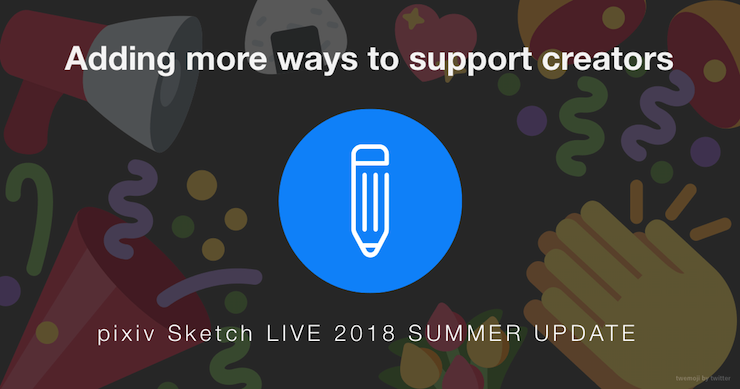 ▲ It appears that pixiv Sketch LIVE will get an update this summer. The teaser website does not give anything away, but people are looking forward to the new features (as of June 12). ── pixiv MARKET, the event in which pixiv ONE will be held, is built based on the concept of "making the doujinshi market cashless through the use of "pixiv PAY"". The two of you are probably familiar with the doujinshi market, but what do you think about getting the app? Not having to use cash itself sounds convenient. Coins get stuck and heavy; carrying too many coins can be a nightmare. And I guess eliminating cash also makes it easier to manage sales. Coins are hard to prepare and bring home, so by making the market cashless, everything becomes practical. I really like this idea. I think it's useful for those who sell doujinshi too. And this may be a stupid comment, but I like how the word "cashless" sounds futuristic (laughs). ── I have installed the app myself and the one feature that I personally think is nice is the one that enables us to send messages to the sellers. ▲ A video on how to use pixiv PAY【For sellers】. Go to 1:30 to learn how to send an announcement. 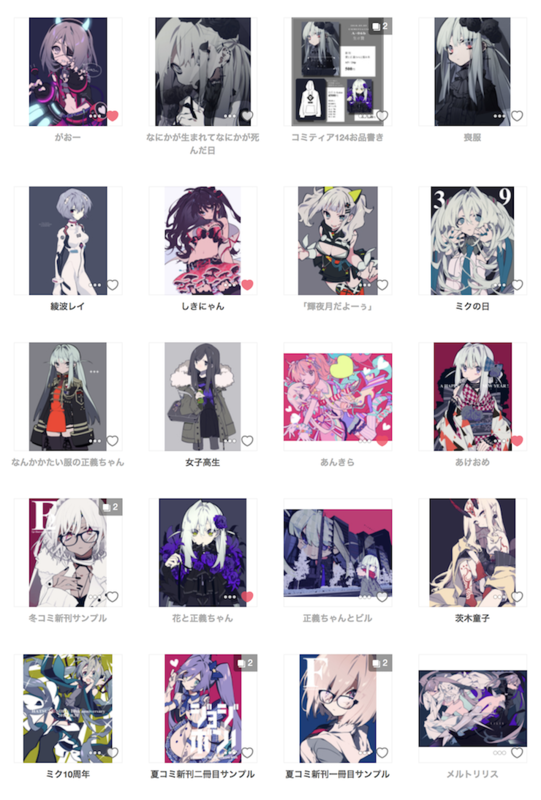 ── Also, the app has a list of circles that use pixiv PAY. This is a great feature to utilize before going to doujinshi events, such as Comiket. ── The benefit of this "cashless" app does not stop only at the elimination of coins; it can also be utilized to manage various things as data. I feel like this app has many potentials. And, this doesn't have anything to do with "cashless", the circles that are going to participate in pixiv MARKET are all famous; it's unbelievable. All of them belong to the walls (i.e. super major circles that get positioned along the walls at doujinshi events) (laughs). They're all well-known! It's such an epic lineup, I was honestly surprised. ── The idea of drawing live with all of these people watching may feel like a lot of pressure to you both, but we're all looking forward to your good performance! The two creators will participate in pixiv ONE, which will start from 14:00 JST on June 10, 2018 (Sun.)! So, how did you like the interview? You can watch pixiv ONE live from 14:00 JST on June 10 (Sun.) by going to the site which will be specially installed for "pixiv MARKET" or by accessing the URL below. It will be an hour filled with superb skills and anticipation, so be sure to enjoy it to the fullest! An animator and illustrator. He is well-known as a highly skilled creator. 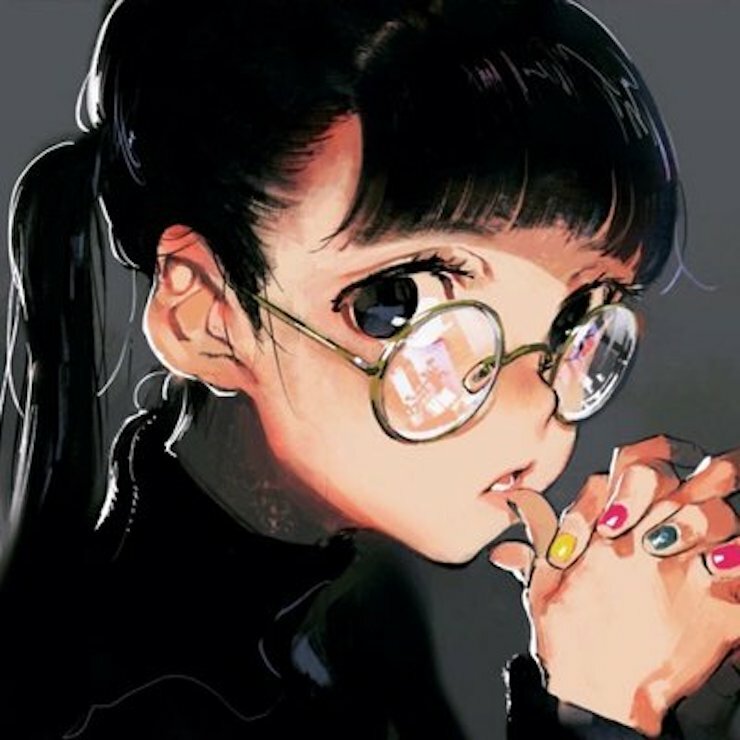 As an illustrator, he has been entrusted to design the illustration for "Racing Miku 2016", the character design of the anime "Kiznaiver", and to be the production and animation director of the ending video in "DARLING in the FRANXX", a 2018 anime. A young illustrator who is gaining popularity for his edgy design. He does all of his drawings with a tablet. His participation as an illustrator ranges from character design in the video game industry to literature. He illustrators the cover arts for "Enmado sara no suiri kitan", a novel series by Kanata Kimoto.